The dramatic October 25 announcement by the board of Tata Sons, the flagship of the Tata Group, that it had sacked Cyrus Mistry, its Chairman, was sensational news that shocked the Indian corporate sector not to mention such sectors of many countries. Tata’s operate in over 100 countries the world over. Mr. Mistry (52) an Irish passport holder, was appointed four years ago. But he had served on the main Tata board, is a Tata shareholder and also heads several of its listed units. On the other hand his family, the Pallonji’s own one-fifth of Tata Sons. Thus he is a powerful figure in this gigantic Indian business combine. One thing that cannot quite be comprehended is that despite all that experience and also the power he wielded, what induced Tata’s to launch a worldwide search for a successor to Ratan Tata (who is easily one of India’s most respected business leaders) when he retired as chair of Tata Sons in 2012. The reasons adduced for Mistry’s dismissal – he failed to deliver and Tata’s began to feel the pinch of some of his actions. As we go on let us examine this. 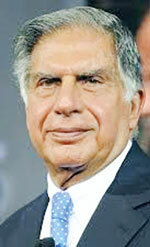 The Tata’s, India’s largest and most diversified business organisation is also one of the country’s most admired. The group’s performance is sort of a barometer of India’s economic health and fortunes and a broad outlook of positivity emanating from Tata’s is considered favourable even from a national perspective. Of course it could also be the other way round. Tata’s was founded by Jamsetji Tata in 1869 who was the first into textile manufacture and later on to the manufacture of iron and steel. Tata Iron and Steel in Jamshedpur in due course expanded by leaps and bounds and in the process also changed India’s industrial landscape. Steel as Jamsetji is said to have learned in England was like gold for a developing country like India was by the 19th century. Jamsetji was succeeded by his nephew Jehangir Tata who steered the ship of Tata’s for long years during which period it went on to reach mammoth proportions in industrial production. It established manufacturing enterprises in all parts of India and its production range reached almost every household. Ratan Tata (now 78 years old) succeeded J.R.D or Jehangir Tata and not only continued the momentum of growth but added new vigour into the massive organisation. He was indeed, its principal agent of change and diversification. Towards the later years under his helm Tata’s entered the modern phase of industry and services. It was thus into the era of globalisation in which technology was to play a vital role in industrial progress. Indian correspondent of the ‘Island’ newspaper S. Venkat Narayan quoting Mukund Rajan, member Executive Council of Tata Sons, and its brand custodian, notes that it was Ratan Tata’s vision that was the key to the group’s march and ascendancy. Rajan further comments that at the turn of the present century, the group had a relatively small market cap, which was just under US$6 billion but it added $100 billion plus by 31st March 2015. Market capitalisation of the Tata group had reached $134 billion and it had a presence in 100 countries and direct employment afforded to some 600,000 people by end March last year. Rajan had disclosed that Tata’s planned to be among the 25 most admired corporate and employee brands in the world by the year 2040. Within its ambitious drive to be a global corporate power-house it envisaged a market capitalisation that could be compared to the 25 most valuable companies in the world, with its worth reaching $250 billion. Looking back briefly into history, since 1992 India gradually embraced economic liberalisation and began integration with the global economy. It was not an impressive change at the start and was painfully slow. But it yet did a world of good and was India’s launch pad into modernism. The dawn of comprehension of the realities of the modern age which was capitalised on by Tata’s rested on Ratan Tata, a product of US education at the eminent Stanford University where he studied architecture. It was Ratan Tata who made the difference. Tata’s progress could also be a phenomenon largely prevalent in the moderate industrial world – mergers and acquisitions. Today such mergers and acquisitions are to a degree common and usually they are vertical mergers or acquisitions. This implies that a firm in a particular industry would prefer to merge or acquire a similar or identical industry than an industry that is outside their domain of activity. The most frequent mergers one comes across in the industrialised world take place between large pharmaceutical manufacturers. Coming back to Tata’s and to their acquisitions which have contributed to their rapid progress, they successfully bought over, Tetley, JDL and Corus all of British origin, to go global. And Rajan ventures to state that Tata’s will continue with such a policy in their march towards reaching new heights as a multinational. Several large international firms are however affected by different forms of ‘industrial illnesses’ or failures resulting in their being plunged into repeated crisis. Recently, the German car manufacturer, Volkswagen suffered a grave crisis when its new vehicles were found to be flawed by the purchasers and were returned to the manufacturer. The damage caused resulted in the loss of billions of dollars besides the image bashing that it had to counter. Toyota too suffered a similar fate which led to its vehicles in foreign markets being recalled, causing serious financial losses to it and its reputation tarnished. In such instances the brand value conceptually the biggest marketing instrument suffers as the mindset of the buyers and their faith in a brand is seriously affected. In another direction British pharmaceutical manufacturer Glaxo Smith Kline (GSK) was imposed a huge fine for selling an anti-depressant drug for the young that was found to be completely different to what it claimed to be. The $3.05 billion fine that was slapped on the firm was one of the biggest in the history of pharmaceutical industry. Such episodes do cause serious damage to companies’ reputation and standing in the international market and even effect share transactions in an adverse manner. Similarly, though in a different direction, Tata’s faced a critical situation when it decided to close its recently acquired UK-based steel operations Corus. That created a furore in the British business and industrial circles. Above any other factor the loss of employment to some 7000 became a grave issue to the British administration. On the other hand it is relevant that the steel industry in Europe continuously faces critical times. Steel consuming construction activity depends to a substantial degree on the overall health of the economics of nations. With the economic downturn of many nations within the EU, steel manufacturers were beset with problems largely based on the demand factor. It may be recalled at this stage that another Indian business tycoon Lakshmi Mittal is widely known as the ‘Steel King’. He is based in London. In a scintillating career in steel in which his family, the Mittal’s, have gone global, Lakshmi Mittal’s pet penchant for expansion was the acquisition of steel plants in Europe that were on the sick list and restore their operations. But he came up against a virtual pan-European resistance when he made a bid to acquire Arcelor, the giant European steel manufacturer. Indeed the European Parliament was concerned that a non-European had bid to take over their venerable enterprise. But Lakshmi Mittal won the day ultimately. And now you find that Arcelor-Mittals is one of the biggest steel firms in the world. But to return to Tata’s, a few years ago it faced another crisis. This time it was in neighbouring Bangladesh. For a long time Tata’s was planning to establish a huge electricity plant in Bangladesh but during the final phase of their plans for the $2.5 billion investment it came up against big barriers and this made them give up the project. Another venture of Tata’s that failed to take off was the Nano motor car manufacturing project that it had planned to establish in Bhopal. But the project failed on account of environmental factors in which the people in Bhopal were involved. This was yet another big crisis that Tata’s confronted a few years ago. All these took place during the time Cyrus Mistry was Chairman. Just a day after the latest crisis the Tata’s confronted, following the removal of Cyrus Mistry, Tata stocks stumbled. Shares of Tata Steel one of the group’s oldest entities went down by 2.89 per cent, Tata Motors by 1.7 per cent and the giant IT operation, Tata Consultancy Services was down by 0.75 per cent. Contributing towards Mistry’s dismissal was also perhaps his failure to bring about a settlement in regard to a long running dispute with NTT DoCoMo, the Japanese Mobile Phone manufacturer which is demanding an arbitration based payment of $1.7 billion awarded to it following an international hearing. All these developments are likely to dent Tata’s international reputation, at least temporarily. The latest in this acrimonious affair relates to Mistry hitting back with counter claims relating to the failure of governance by the main Tata Board, which he says has eroded billions of dollars in shareholder value. He also claims interference by Ratan Tata. The row which is very rare at this level of India’s corporate life so much so that it led to the aides of the Prime Minister Narendra Modi urging Tata’s to act with restraint since it could damage the reputation of Tata’s, the undisputed leader of Indian business and its oldest. Mistry’s blistering communication in this regard which had gone viral has evoked an equally nasty response from Tata’s who say that Mistry’s correspondence marks unsubstantiated claims and malicious allegations. Also Tata’s responding to Mistry’s five-page letter says that it will be replied to in an appropriate manner. Mistry states that Ratan Tata and the board of Tata Sons had failed to give him room and that Ratan had acted as an alternate power centre. He cites the case of Ratan driving deals to create two airline businesses. More damaging was Mistry’s accusation that Tata Motors extended credit to add to sales, and that when some fraudulent dealings with Air Asia surfaced the response to forestall it was not quick enough. Some workers at Tata’s, it has emerged, are deeply upset by the treatment meted out to Cyrus Mistry. It is further reported by Reuters that three senior executives have resigned from the firm following this explosive situation. There is now speculation that the accusations and counter accusations will lead to a legal battle. The crisis, unfortunately for Tata’s and Indian business in general continues with shareholders awaiting a return to normalcy.